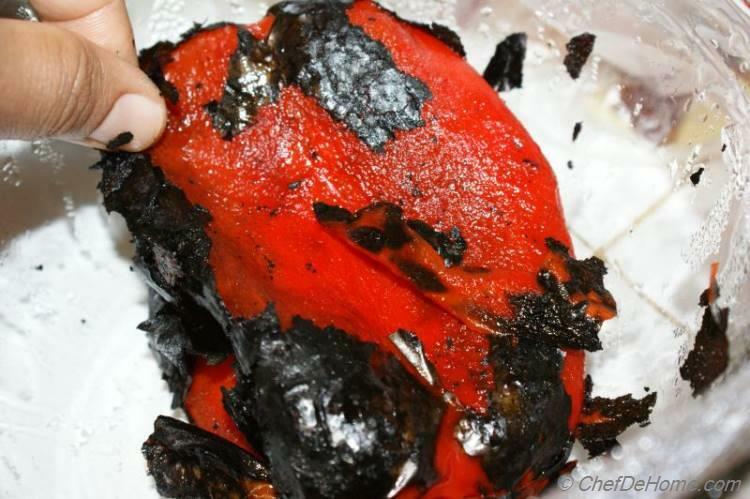 Roasting red bell peppers releases natural sweet peppers taste and get wonderful charred flavor. Roasted Bell Peppers are best accompaniments with Tangy Cheeses like Goat Cheese. Red color of Red Bell Peppers gives any dish a wonderful color. 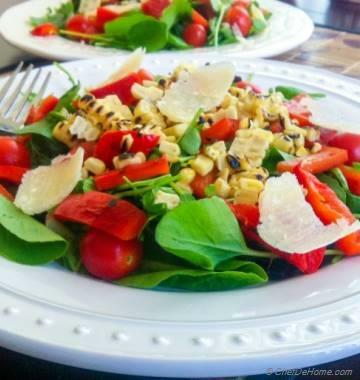 You can make so many dishes with Roasted Peppers. Dips, Soups, Pastas, Sandwiches, options are endless. Pepper Soup is one of best examples of using roasted peppers for their sweet, charred. 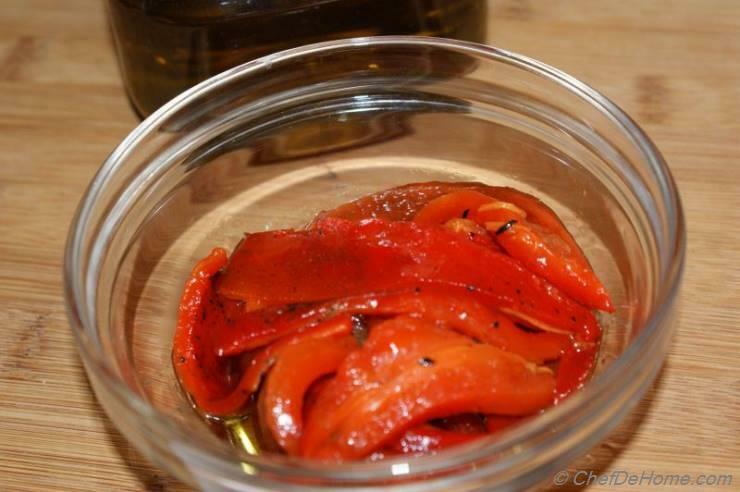 You can also preserve roasted peppers in good quality oil in an airtight container for up to 2 weeks or in a sealed container for up to 6 months. 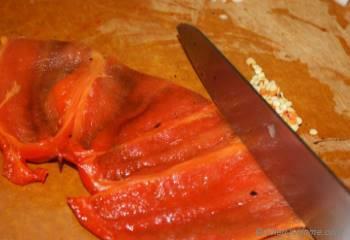 If you do not have Oven, you can roast peppers on grill or home gas stove top too. 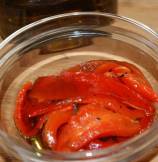 Buy good quality peppers when available and roast to preserve for later use. Pre-roasted peppers come in handy in dishes like Soups or Pastas. Above all it has tag of Home Made and also saves you time and money gone in buying a jar of peppers. 1. 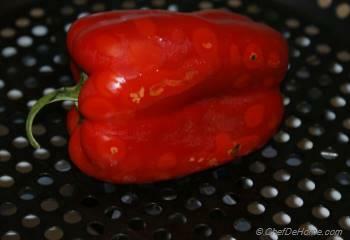 Before roasting bell peppers, it is very important to oil the skin of pepper. 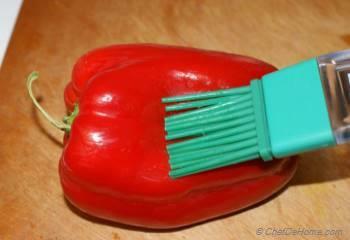 So to stat with, rub or brush oil on surface of red bell peppers. 2. Leave bell peppers on open gas flame Or Grill. Turn it every few minutes to avoid burning of pulp. Wait for bell peppers skin to get charred from all sides. Immediately shift in a bowl and cover with Plastic Wrap. Let it cool to room temperature. 3. Once cooled, remove the charred bell pepper skin. 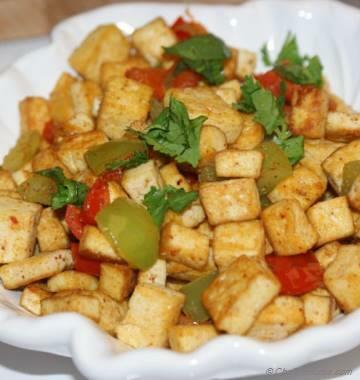 Make sure not to wash the pepper under water as that will wash off all good flavors and juices. 4. Cut open the peppers, remove seeds and slice in ribbons. 5. 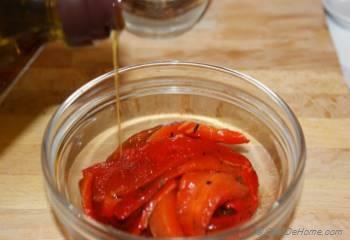 Place peppers in a container and cover with rest of the oil. Keep refrigerated till needed. Roasted Bell Peppers are best accompaniments with Tangy Cheeses like Goat Cheese. 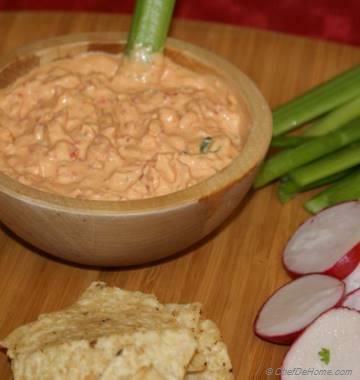 Try our roasted bell pepper and goat cheese dip recipe and you will love how versatile roasted peppers can be. Thanks chefdehome!!! I never roasted bell pepper at home, always store bought. But these step make it look so easy. I will try it at home this time.